TOKYO, April 2, 2019 /PRNewswire/ -- Global cryptocurrency platform Liquid launched its own leveraged Bitcoin Contract-for-Difference (CFD) product, known as Liquid Infinity. Liquid is the world's largest crypto-fiat platform by transaction volume, regulated in Japan, with the world's highest trading volume for the BTC/JPY pairing. Up to 100x leverage. Leverage positions are determined by the position size. The ability to cross-margin positions to balance margin maintenance requirements on Liquid. Access to liquid markets provided by BTC/JPY and BTC/USD pairings on Liquid. Mario Gomez Lozada, Chief Product Officer of Liquid, said, "We are well-known for our advanced trading platform features geared towards pro traders, in particular our core margin product with up to 25x leverage. We saw a rising market demand for Bitcoin CFD products with appetite for higher leverage, which led to the development and launch of Liquid Infinity. Infinity will enable traders to amplify their risk-to-reward ratios with the existing risk management tools we have in place for our margin product, such as stop-loss orders and other advanced charting indicators." Liquid Infinity is available to Liquid customers except for residents of Japan. Today, Liquid is the world's largest crypto-fiat platform by transaction volume, regulated in Japan. 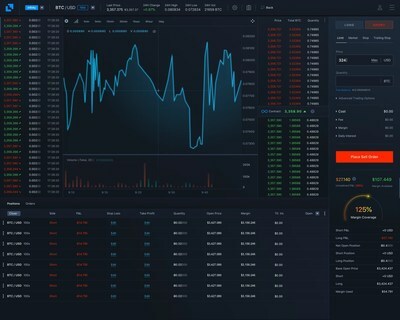 Powered by the World book, which provides customers enhanced price matching and deeper liquidity for various fiat and cryptocurrency pairs, Liquid offers trading services for major cryptocurrencies, such as Bitcoin and Ethereum against fiat currency pairs in Japanese yen, US, Singapore and Australian dollar, and Euro.